One of our very own wedding Chicks is both knocked up and also just happens to be a bridesmaid in an up and coming wedding. We're not talking cute little five-month belly, by the time the wedding rolls around she will be major eight months pregnant. Obviously, the other bridesmaids want to wear flatter figuring dresses that probably won't fit most us when were eight months pregnant. If you ever been pregnant then you know that when your eight months pregnant, you feel like an orca. Trust us, you don't look like an orca you do look beautiful it's just the overall feeling that most of us get around that time in the pregnancy. So, finding a dress that will fit/look cute and go with the other bridesmaid dresses was a tad challenging. The other bridesmaids would find dresses and she would then see if the dress could be deconstructed to fit her. Luckily... it did not come to this and she was able to find some great bridesmaid dresses that the bride liked and actually fits girls with buns in the oven. She also has a few tips to share with brides-to-be about having pregnant bridesmaids, so read on. Don't want to read and just want to Shop for dresses for your pregnant bridesmaid. Well then be our guest and jump on over to here. If you are a bride and one of your bridesmaids is pregnant, the biggest tip we have for you is let your bridesmaid dresses be a flexible pallet. Choosing a very specific pattern or style will make it hard for the whole bridal party to find something that fits. Stick with solid colors to leave endless options for your girls. Mismatched bridesmaids look fabulous and everyone can find a dress that matches their body type. Pink Blush Maternity has a plethora of options and colors to match any wedding style and color. This sleeveless, chiffon maternity gown below is $109. The perfect price. Because let's be honest she is not wearing it again. 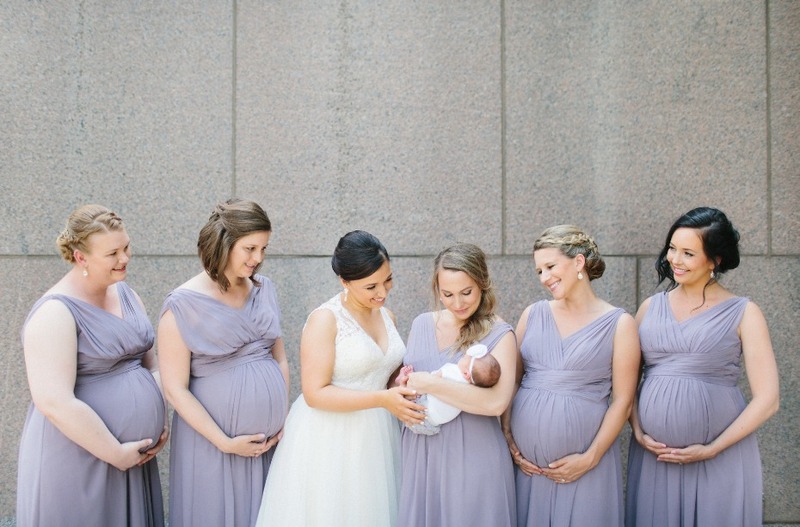 How cute do these bridesmaids look? 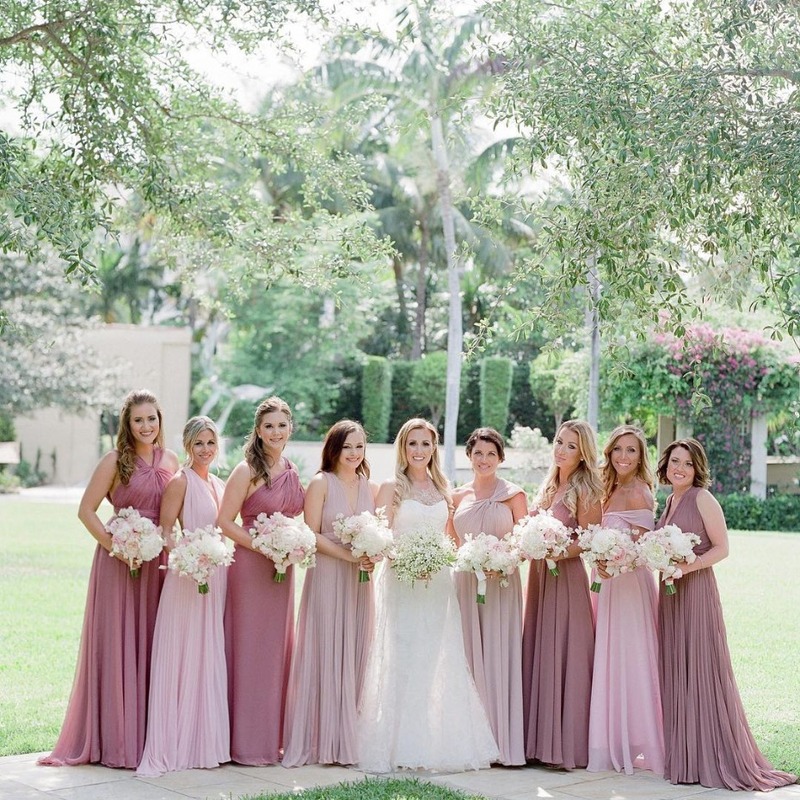 Although none of Paige's bridesmaids were pregnant at the time of her wedding, it is a great representation of all the girls in different dresses in the same exact hue. All the dresses are from Show Me Your Mumu. Show Me Your Mumu offers dresses that will work for pregnancy and regular girls. If you really want everyone to wear the same exact dress, they've got you covered. Bonus! They can wear the dress again. It's a bit pricier but, their dresses are definitely made to be worn more than once. 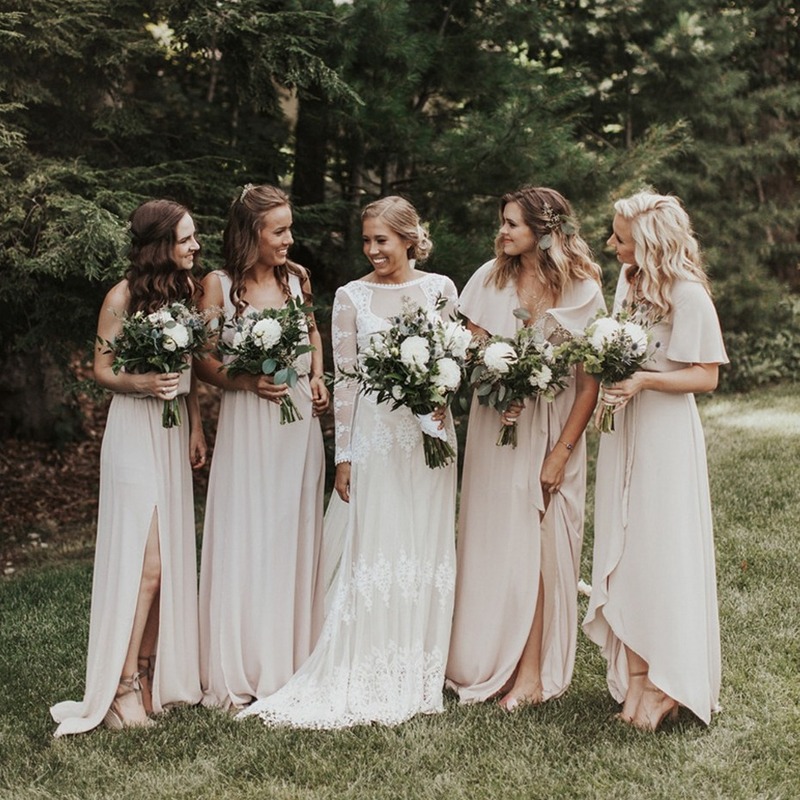 Your bridesmaid might not even be showing at all when you order dresses and might need to exchange or need major alterations once she has a huge bump for your wedding day. Check return and exchange policies from where you order. 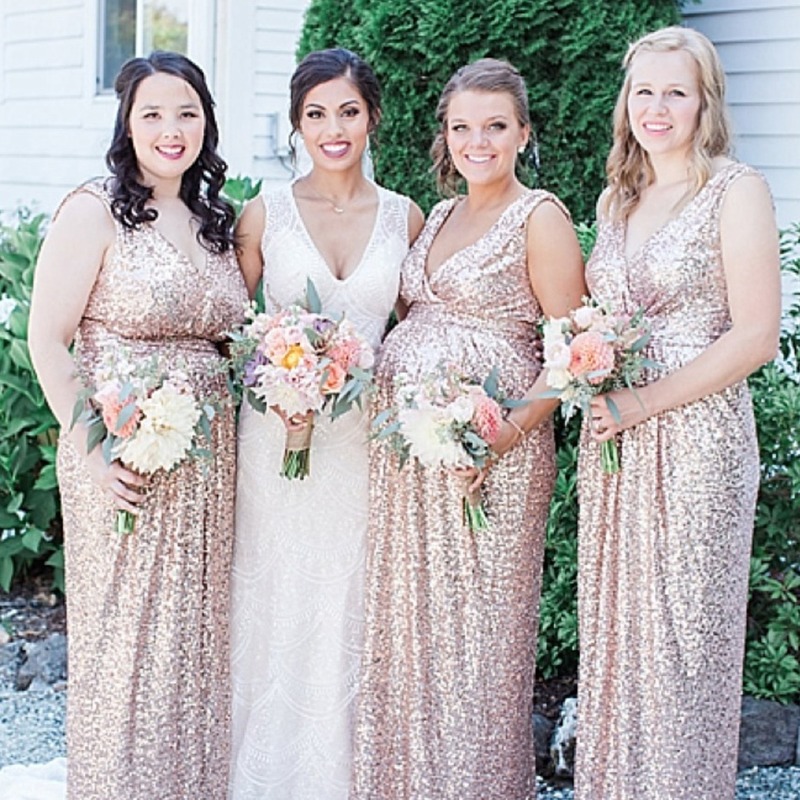 Sequined bridesmaid dresses are all the rage and still is an option if you have a pregnant bridesmaid. Consider using a service like Rent The Runway like the bride and her bridal party did above. This particular Badgley Mischka dress has some stretch and accommodates a bump. Bonus! This glitzy dress retails for $650, but your bridesmaids can rent them for $90. Your bridesmaid is not only cashing out all this $$ that comes with being a bridesmaid, but she’s spending a ton left and right on hospital bills, new baby furniture, baby clothes. This is your special day, but being mindful of choosing something that’s not going to put your girls in debt is always a good rule of thumb. Bun in the oven or not. 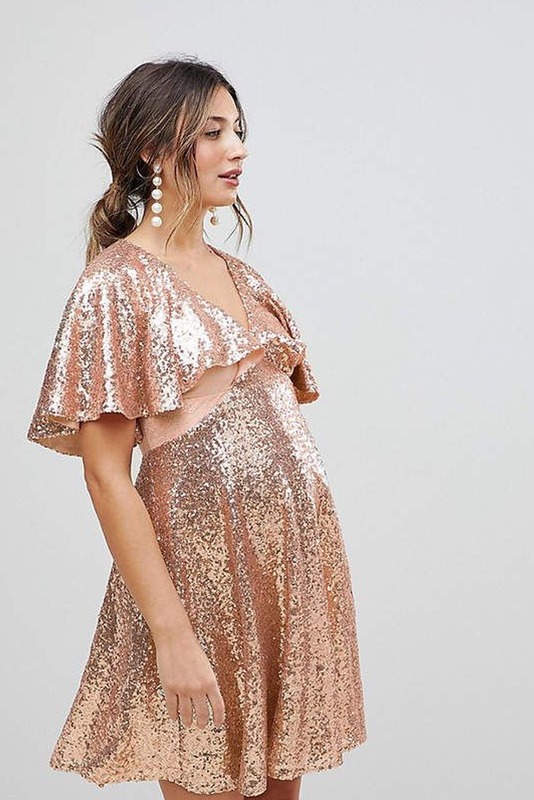 Asos also has some great bridesmaid maternity dresses that are also budget-friendly like this rose gold sequined maternity dress that is only $34.50. If you're not ok with the whole mismatched fabric trend but are ok with the different style trend, Jenny Yoo is for you. They offer luxury bridesmaid dresses along with a few maternity styles in the same beautiful fabric. The Cerise dress below comes in that gorgeous chartreuse color that the bridesmaids are wearing above. As you see a ton of great dresses for pregnant bridesmaids. 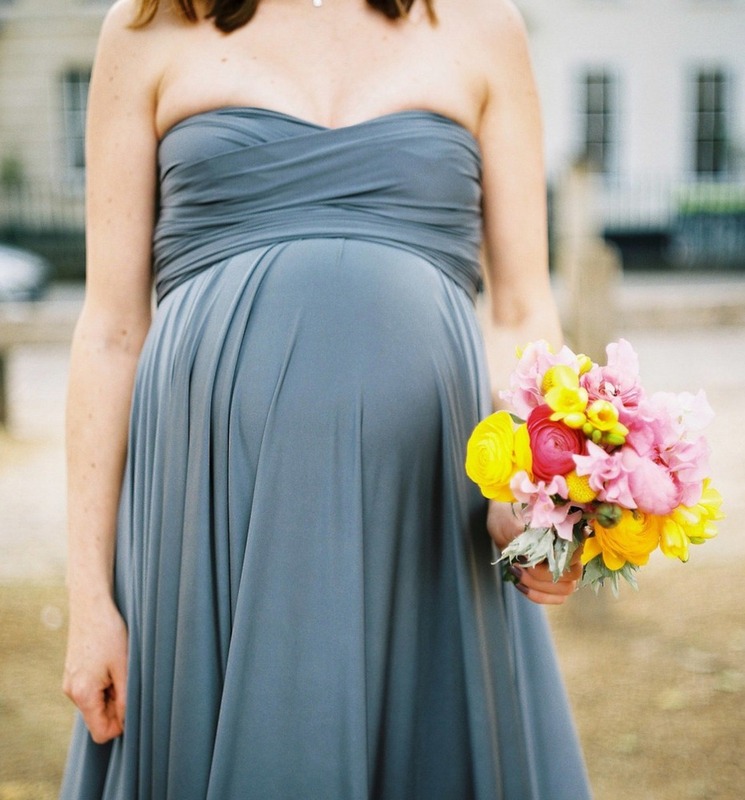 Below is a shopping recap of our fave maternity bridesmaid dresses. Let us know if we missed any by leaving a comment below.